And the blog goes on to state that the first group of invites have been sent to the participants who had contributed towards its development. 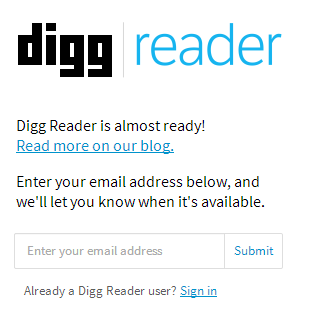 Digg Reader has also been made available for iOS users. For a change no separate download is required as Digg has bundled the Digg Reader with Digg iOS App. 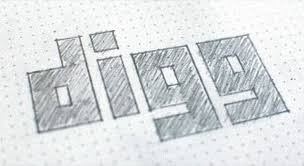 From within the Reader App a user can “digg” the feed he/she likes while are reading which in turn will feature in the latest trending content diggs based on the "diggs" it has received. Digg has promised to enhance the reader experience the users had with Google Reader to a completely new level. The keyboard short cuts in Digg Reader are similar Google Reader for instance j and k to move between articles, s to save, d to Digg and v to view URL. Depending on their preferences, users can view feeds in either List or Expanded View. They can also save their feeds to Instapaper, Pocket or Readability, or share articles to Twitter and Facebook. You also have full privacy authority over Digg Reader by choosing your profile to be either public or private. If you own a iOS device and are interested to checkout the latest offering from Digg, update your Digg App from Apple Store here. Android users would have to wait 1 more day for the App, I suppose. PC users can visit here to keep a track on announcements.